It's an epic week of poetry this week - Poetry Slam Tuesday night, Canterbury Poets Collective on Wednesday and Lady Poets on Thursday. Next week we're back at the Twisted Hop in Woolston for another Catalyst open mic. 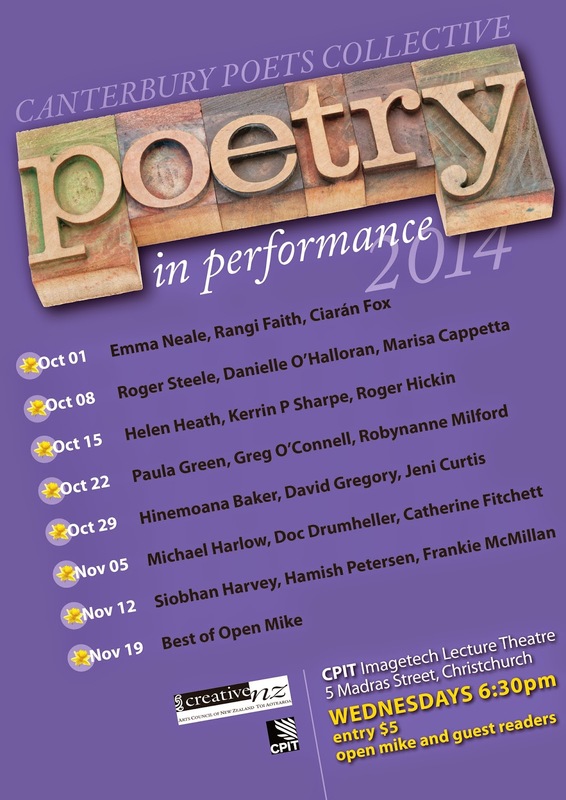 Check out the poster for the CPC Spring readings this year in a new venue. Featuring many excellent poets (including our very own Doc Drumheller and Ciaran Fox) and of course the CPC open mic series. Get along! Kia ora. We have had to postpone the big night for one week but in the meantime here is a handy run-down of the official NZ Poetry Slam rules which we'll be using at the Christchurch heat. Free entry! Koha welcome for the ChCh winners to travel to Wellington.